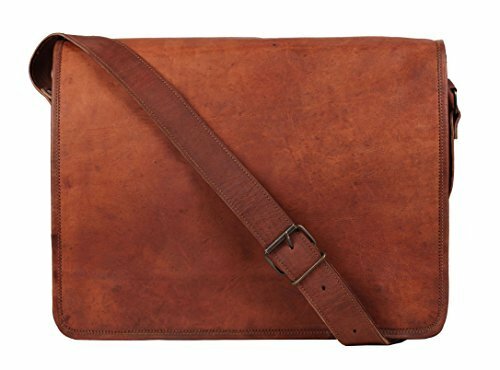 Leather Messenger Bag Leather Laptop Bag Genuine Leather Handcrafted by Indian artisans. This Leather Bag has 3 Internal compartments Inner walls are well padded for keeping Ipad, cigarette box, wallets, laptop, etc. Rustic Town is connected with a number of Organizations within India which work to bring employment to artisans and keep alive traditional skills. Size 15"x11"x4" Inches Gift Ideas Unisex 100% genuine Leather Messenger Bag, Its naturally tanned leather and eco friendly too. Quality hardware on the bag. This leather messenger bag is ideal and prefect for carrying small other stuff. This bag give you feel of retro / vintage look. A Fair Trade Product, Rustic Town is connected with a number of Organizations within India which work to bring employment to artisans and keep alive traditional skills.